This entry was posted in Photography on September 21, 2010 by Ryan Curtis. This entry was posted in Photography on April 7, 2010 by Ryan Curtis. This Tiger Shrimp has been displaying this red color for quite some time now. 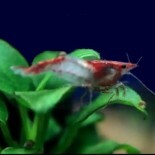 The red on this Tiger Shrimp was first observed in my Soft Water Shrimp in Hard Water experiment! While taking pictures I noticed the Ramshorn snail that I first pictured in the A Few Random Pictures post has changed color a little bit! This entry was posted in Photography on July 28, 2008 by Ryan Curtis. Again I was messing with my Nikon D40 and figured I would post a few new pictures of some of my shrimp. This entry was posted in Photography on July 16, 2008 by Ryan Curtis. I was messing around with my Nikon D40 today and took a couple pictures I though would be worth sharing. First is a unique Ramshorn Snail that I have in one of my shrimp aquariums. This is the only Ramshorn snail I have that looks like this! Unique! Also here is another photo of some of my Caridina sp. There are still no berried females in this aquarium, I am still waiting to see what happens! This entry was posted in Photography, General on July 12, 2008 by Ryan Curtis.